In this project we implemented the ability to control audio/video equipment, lighting, curtains and blinds drives, climate, ventilation and air conditioning, as well as gates/access. For the control interface we employed a unique software package from iRidiummobile, which was installed on a Tablet PC iPad and the iPhone. Lighting control, gates/access, curtains and blinds drives (U.S. drive function), and the heating system is implemented on the Domintell automation. Also Domintell has the task to promptly notify owners of any emergencies in the home, such as water leakage, power outages, the transition to backup power, etc. To monitor and control HVAC system we used communications equipment from different manufacturers working on protocol Modbus. The monitoring system uses IP-CCTV cameras for excellent image quality and ease of monitoring. IP door entry systems grants the ability to video conference with visitors, even if you 're away from home. As to receivers panels – we used tablet gadgets and smartphones. Number of audio/video equipment in residential areas is minimized at the expense of organized HD-video sourcing from the server-room. 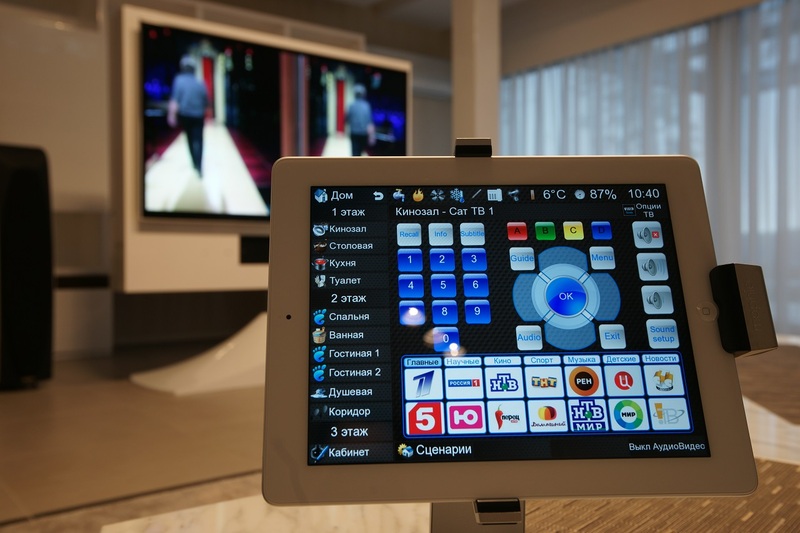 While full access to them from any room in the house is granted permanently, by means of control via iPad or iPhone. And of course, monitoring and management utilities in the house can be accessed from anywhere in the world, you only need to connect to the Internet.